The domain within your query sequence starts at position 1 and ends at position 107; the E-value for the WH1 domain shown below is 1.01e-38. Region of the Wiskott-Aldrich syndrome protein (WASp) that contains point mutations in the majority of patients with WAS. Unknown function. 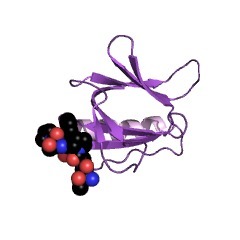 Ena-like WH1 domains bind polyproline-containing peptides, and that Homer contains a WH1 domain. The EVH1 (WH1, RanBP1-WASP) domain is found in multi-domain proteins implicated in a diverse range of signalling, nuclear transport and cytoskeletal events. This domain of around 115 amino acids is present in species ranging from yeast to mammals. Many EVH1-containing proteins associate with actin-based structures and play a role in cytoskeletal organisation. EVH1 domains recognise and bind the proline-rich motif FPPPP with low-affinity, further interactions then form between flanking residues [(PUBMED:11911879), (PUBMED:9312002)]. 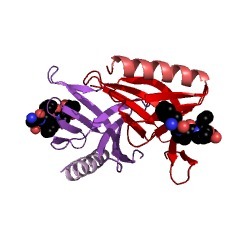 WASP family proteins contain an EVH1 (WH1) in their N-terminals which bind proline-rich sequences in the WASP interacting protein. 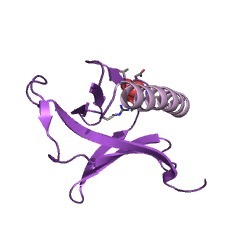 Proteins of the RanBP1 family contain a WH1 domain in their N-terminal region, which seems to bind a different sequence motif present in the C-terminal part of RanGTP protein [(PUBMED:9883880),(PUBMED:7724562)]. 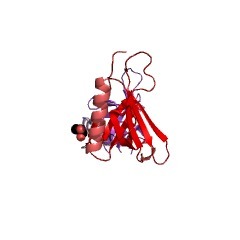 Tertiary structure of the WH1 domain of the Mena protein revealed structure similarities with the pleckstrin homology (PH) domain. The overall fold consists of a compact parallel beta-sandwich, closed along one edge by a long alpha-helix. A highly conserved cluster of three surface-exposed aromatic side-chains forms the recognition site for the molecules target ligands. [(PUBMED:10338211)]. There are 4280 WH1 domains in 4278 proteins in SMART's nrdb database. Taxonomic distribution of proteins containing WH1 domain. This tree includes only several representative species. The complete taxonomic breakdown of all proteins with WH1 domain is also avaliable. Click on the protein counts, or double click on taxonomic names to display all proteins containing WH1 domain in the selected taxonomic class. Structure of the enabled/VASP homology 1 domain-peptide complex: a key component in the spatial control of actin assembly. 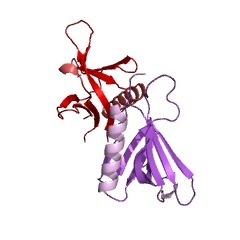 The Enabled/VASP homology 1 (EVH1; also called WH1) domain is an interaction module found in several proteins implicated in actin-based cell motility. EVH1 domains bind the consensus proline-rich motif FPPPP and are required for targeting the actin assembly machinery to sites of cytoskeletal remodeling. 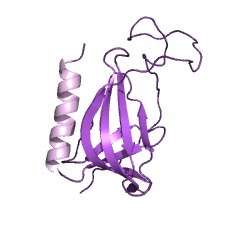 The crystal structure of the mammalian Enabled (Mena) EVH1 domain complexed with a peptide ligand reveals a mechanism of recognition distinct from that used by other proline-binding modules. 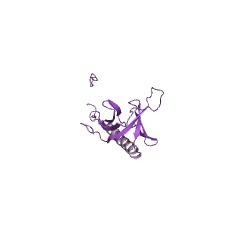 The EVH1 domain fold is unexpectedly similar to that of the pleckstrin homology domain, a membrane localization module. This finding demonstrates the functional plasticity of the pleckstrin homology fold as a binding scaffold and suggests that membrane association may play an auxiliary role in EVH1 targeting. 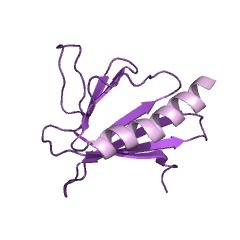 EVH1/WH1 domains of VASP and WASP proteins belong to a large family including Ran-binding domains of the RanBP1 family. The two cytoskeletal proteins VASP and WASP and the protein Homer share a conserved domain, currently designated the WHI domain (WASP homology domain 1) or EVH1 domain (ENA/VASP homology domain 1), which could play an important role in various cellular events such as transport, folding of proteins, and signal transduction. We report here additional occurrences of this domain in Ran-binding proteins of the RanBP1 family and various others proteins, or putative proteins of eukaryotic organisms, suggesting that the EVH1/WH1 domain may be more widely used than originally thought. 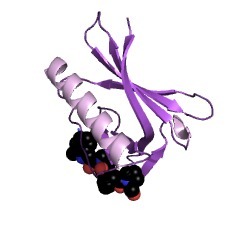 A novel proline-rich motif present in ActA of Listeria monocytogenes and cytoskeletal proteins is the ligand for the EVH1 domain, a protein module present in the Ena/VASP family. The ActA protein of the intracellular pathogen Listeria monocytogenes induces a dramatic reorganization of the actin-based cytoskeleton. 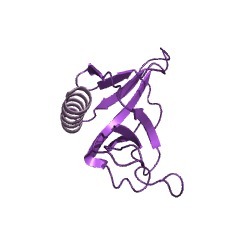 Two profilin binding proteins, VASP and Mena, are the only cellular proteins known so far to bind directly to ActA. 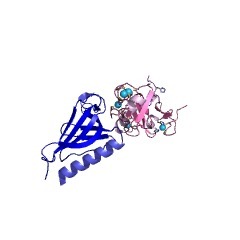 This interaction is mediated by a conserved module, the EVH1 domain. We identify E/DFPPPPXD/E, a motif repeated 4-fold within the primary sequence of ActA, as the core of the consensus ligand for EVH1 domains. This motif is also present and functional in at least two cellular proteins, zyxin and vinculin, which are in this respect major eukaryotic analogs of ActA. The functional importance of the novel protein-protein interaction was examined in the Listeria system. Removal of EVH1 binding sites on ActA reduces bacterial motility and strongly attenuates Listeria virulence. Taken together we demonstrate that ActA-EVH1 binding is a paradigm for a novel class of eukaryotic protein-protein interactions involving a proline-rich ligand that is clearly different from those described for SH3 and WW/WWP domains. This class of interactions appears to be of general importance for processes dependent on rapid actin remodeling. Identification of homer as a homologue of the Wiskott-Aldrich syndrome protein suggests a receptor-binding function for WH1 domains. Mena, a relative of VASP and Drosophila Enabled, is implicated in the control of microfilament dynamics. Drosophila Enabled is required for proper formation of axonal structures and is genetically implicated in signaling pathways mediated by Drosophila AbI. We have identified two murine proteins, Mena and Evl, that are highly related to Enabled as well as VASP (Vasodilator-Stimulated Phosphoprotein). 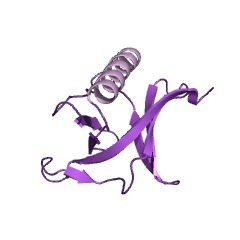 A conserved domain targets Mena to localized proteins containing a specific proline-rich motif. The association of Mena with the surface of the intracellular pathogen Listeria monocytogenes and the G-actin binding protein profilin suggests that this molecule may participate in bacterial movement by facilitating actin polymerization. Expression of neural-enriched isoforms of Mena in fibroblasts induces the formation of abnormal F-actin-rich outgrowths, supporting a role for this protein in microfilament assembly and cell motility. Wiskott-Aldrich syndrome protein, a novel effector for the GTPase CDC42Hs, is implicated in actin polymerization. The Rho family of GTPases control diverse biological processes, including cell morphology and mitogenesis. We have identified WASP, the protein that is defective in Wiskott-Aldrich syndrome (WAS), as a novel effector for CDC42Hs, but not for the other Rho family members, Rac and Rho. 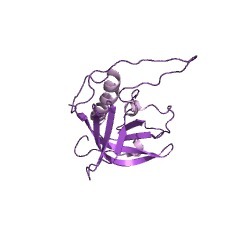 This interaction is dependent on the presence of the G protein-binding domain. Cellular expression of epitope-tagged WASP produces clusters of WASP that are highly enriched in polymerized actin. This clustering is not observed with a C-terminally deleted WASP and is inhibited by coexpression with dominant negative CDC42Hs-N17, but not with dominant negative forms of Rac or Rho. Thus, WASP provides a novel link between CDC42Hs and the actin cytoskeleton, which suggests a molecular mechanism for many of the cellular abnormalities in WAS. 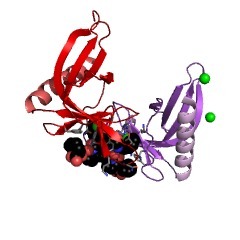 The WASP sequence contains two novel domains that are homologous to other proteins involved in action organization. Isolation of a novel gene mutated in Wiskott-Aldrich syndrome. Wiskott-Aldrich syndrome (WAS) is an X-linked recessive immunodeficiency characterized by eczema, thrombocytopenia, and recurrent infections. Linkage studies have placed the gene at Xp11.22-p11.23. We have isolated from this interval a novel gene, WASP, which is expressed in lymphocytes, spleen, and thymus. The gene is not expressed in two unrelated WAS patients, one of whom has a single base deletion that produces a frame shift and premature termination of translation. Two additional patients have been identified with point mutations that change the same arginine residue to either a histidine or a leucine. 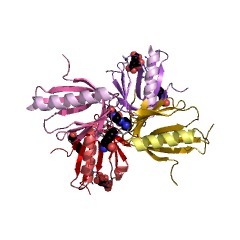 WASP encodes a 501 amino acid proline-rich protein that is likely to be a key regulator of lymphocyte and platelet function. SwissProt sequences and OMIM curated human diseases associated with missense mutations within the WH1 domain. This information is based on mapping of SMART genomic protein database to KEGG orthologous groups. Percentage points are related to the number of proteins with WH1 domain which could be assigned to a KEGG orthologous group, and not all proteins containing WH1 domain. Please note that proteins can be included in multiple pathways, ie. the numbers above will not always add up to 100%. 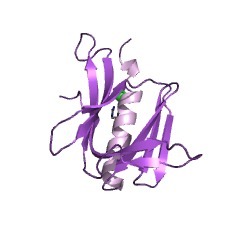 3syx Crystal Structure of the WH1 domain from human sprouty-related, EVH1 domain-containing protein. 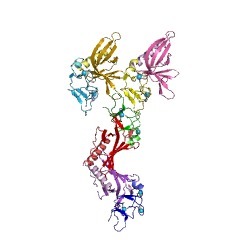 Northeast Structural Genomics Consortium Target HR5538B.